It’s the day circled on every fantasy footy fanatic’s calendar – draft day. The single greatest day of the year. Better than Christmas, your birthday, a mate’s bucks, the day your first child is born and (perhaps) even Shrove Tuesday (pancakes, am I right?). The day you get together with your mates and try to draft the ultimate fantasy squad to climb the mountain to premiership glory, all whilst sinking their hopes and dreams (and possibly/probably a few refreshing ales). I’ve played almost every fantasy sport there is: footy, NBA, MLB, cricket, soccer, Bachelor (surprisingly fun!) and my other favourite, NFL. One of the fun parts about preparing for my NFL drafts is participating in mock drafts and seeing how my teams can look by employing various strategies. How late can I wait on a sleeper I like? What happens if I prioritise one position over another? Who is going off the board earlier than expected? I can do a bunch of these drafts and come in more prepared than if I just had my rankings sheet and was hoping. I have more strategies and knowledge about the depth of the draft heading in. I’m giving myself the best chance I have to get things right from the start and take the league title. Also, it’s actually FUN to run a bunch of these drafts, trying to always outdo yourself and construct the perfect team! If you’ve only ever played the salary cap version of fantasy footy, firstly, I’m sorry to hear that. But this website will give you a sense of what participating in a draft is like, something you may want to start up with some mates and experience. Trust us, comparing draft to salary cap is like comparing Winx to BoJack Horseman. Until now, such a tool didn’t exist for fantasy AFL. So over at the Draft Doctors, we’ve put our heads together and developed the first Mock Draft Simulator to try and bridge the gap between the ‘gut feel’ of what can happen and what does happen draft day. First, head on over to our website at https://mock.thedraftdoctors.com.au/home. There, you’ll find the homepage. You’ll be asked to simply log in and create a completely free account. From there, click ‘Draft now’, and you’ll enter the selection screen, where you input the details of the league you want to draft against. This the area where you input the data you wish to draft against. We’ve covered the most popular games and settings so you’ll be able to find something that mimics the settings of your league. To start, you’ve got the main three fantasy footy platforms to select from. Average Draft Position (ADP) – where a player is being selected on average. This can rise and fall over the course of the preseason with higher or lower selections by users. You’ll sense trends happening and know who’s slipping and who you might have to go early on if you want them. Average – drafting against last year’s averages. Can give a sense of things if your league tends to expect things to repeat. We’ve removed some LTI’s from the top of the board to increase realism. Draft Doctors Ranks (premium) – Drafting against our own ranks. Gives you a chance to see how good of a team you can pick against players who we’re either hyping up or staying away from. Great if your league is full of savvy drafters. Is only available to full members, which we’ll discuss later. The next step, select the way in which your draft runs. Snake – the most common. Start at 1, run to 10 (or whatever is the highest pick in your draft). Then 10 back to one. Repeat. Banzai – the same as snake but the last pick of the first round will draft the first pick of the second and third rounds, before continuing as a normal snake draft. Linear – the first pick of the draft starts first each round and runs to the last pick. Next, select your squad size. We’ve listed the most common squad sizes offered by the various fantasy footy platforms. The positions correspond to the numbers listed on the screen as DEFENDER-MIDFIELDER-RUCK-FORWARD-BENCH. Next, select the number of teams you wish to draft against, and finally, select what position you wish to draft from. The players you’ll be selecting at pick one will be different from those at ten, that’s for sure! This is where using the site will be great for the keen drafter. Seeing what your team looks like after the early rounds drafting from different spots. Of course, if your draft position is locked in, you can try different strategies from that number and see how things shake out. Do teams where you draft a defender at pick 8 look better than those where you take a mid? What happens if you grab a ruck in round 2? Once you’ve entered your settings, you’re ready to click ‘Start’ and find out! Ok, so it’s been a slow build, but in the draft you’ll be greeted by lists. In the top left corner is a counter, letting you know how many players from each position have been drafted. This helps you know which position is in short supply, when a position run happens, etc. Under that is the log of the draft. This lets you see who was drafted with which pick, who went just before you, just after, and of course – your own picks, which are highlighted. On the right of the screen, you can see the make-up of your own team, broken down by position. In the middle of the screen is the player pool. This is where you’ll be drafting your players from. Along with the player names, their ADP is listed. The players are sortable via the tabs above the player list by position or team and are searchable by name. If you’re selecting a dual position player, you’ll be given the option of which position you’d like to select them in. Please note, on the mobile version, to fit the screen, the LOG, the POOL and your TEAM are in three separate tabs; and in the player pool the ADP and average won’t appear next to the player’s name. When you’ve completed your draft you’ll be presented with a summary of your draft, where you can compare your team to the ones you drafted against. You’ll also be able to restart your draft immediately with the same settings by clicking on the ‘Draft again’ button. This year, we’re pleased to have added two new features to the site for members. We’ve added the option of downloading your mock draft to review whenever you like; and we’ve added the option of downloading the ever-changing list of player’s average draft position. The second feature is unique in being able to correlate ADP against your own ranks and try to maximise draft value and send your league mates into oblivion! So there you have it. Time to get drafting! We’ve developed the site so that whilst drafts are similar, players do have ranges and won’t be drafted in exactly the same spot so you’ll be having to think on your feet and develop strategies to deal with the curveballs that your real draft will throw at you. Each user will be able to do two mock drafts every day, against the ADP and averages settings. To upgrade your membership so you can run unlimited drafts everyday and draft against our custom rankings, there is a small membership fee. The fee is $9, and runs until we put the site on hiatus once the season is underway. We’ve spent a good deal of time and money getting this bad boy up and running and feel this is a very reasonable amount for a great tool. Rest assured, we’re not making profit, merely trying not to lose and hopefully be able to improve the product with new and exciting features next year. We truly hope you enjoy the site and get enjoyment from it, and improve your drafting skills. 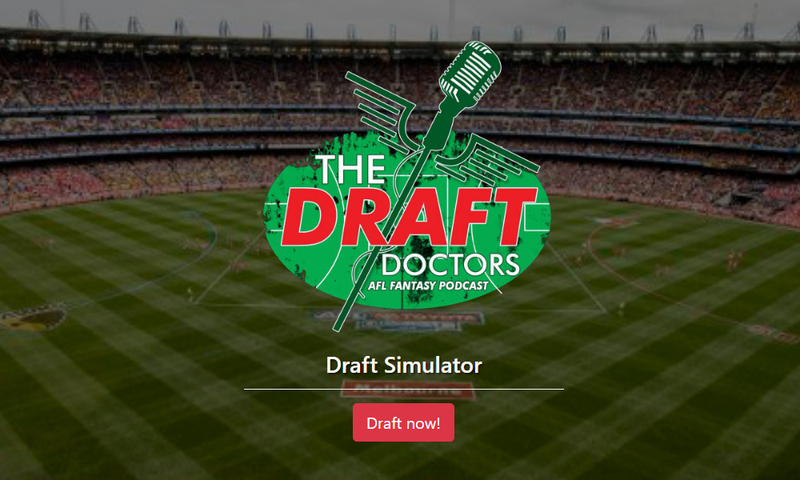 You can catch our year round, weekly podcast at all the usual places (iTunes, SoundCloud, etc) and read our draft focused content and rankings on the website thedraftdoctors.com.au. Complaints, questions, fanmail and love letters can all be sent via social ports, @thedraftdoctors on Twitter and The Draft Doctors on Facebook. Of course we’d like to thank the crew at DT Talk for being supporters of us and giving us the chance to reach a bigger audience. Y’all are kings among men.